An increasing number of international students decides to study in Holland. Last year, more than a quarter of the Master students in Holland had an international background. There is plenty of information about studying in the Netherlands on the internet. However, one thing appears to be missing: independent information about the quality of the Dutch study programmes. The Dutch ‘Keuzegids Masters’ exists for ten years, and is known in Holland as an independent and authorative consumer guide for a critical choice of Master’s degrees. For each study area, the guide provides an overview of all Dutch degrees, including comparative statistics and quality rankings. The guide is available in print and online. Until now our degree guides were exclusively in Dutch.We are now proud to present our online pilot for the Keuzegids Best Masters 2018. For this pilot we translated three popular Dutch study programmes with a high number of foreign students. So if you consider to study Business Administration, International Law or Psychology in the Netherlands, the Keuzegids can help you pick a Dutch degree. 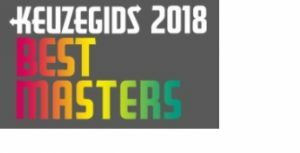 This year the Keuzegids Best Masters 2018 is freely available for everyone. The eventual goal is to give international students in all study fields the chance to choose critically. If there is enough interest, the editors will explore the options of translating more study areas into English. This would eventually lead to a paid product. Are you interested in seeing the entire Keuzegids Best Masters in English, please let us know by sending an email to info@keuzegids.org.